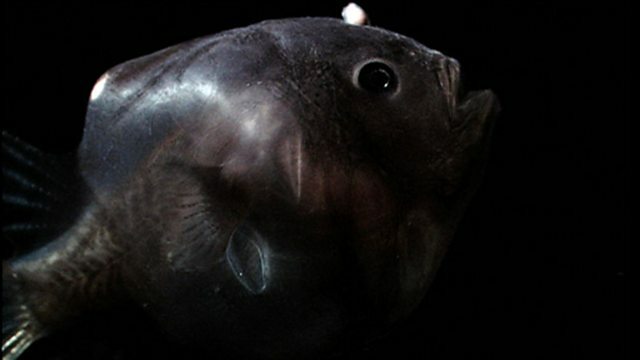 Male angler fish are just a tenth of the size of the females. Their purpose in life is to find a mate somewhere in the darkness. The female releases a scent into the water which the males can detect. Once he's found a female, the male attaches himself permanently to the her with his teeth. Over the next few days the male fuses to the female, her blood circulating around him to keep him alive. The female then benefits from a constant supply of sperm, which would ordinarily be very difficult to find in the vastness of the deep ocean.